← Whiskey or Whisky – Let’s Talk History. 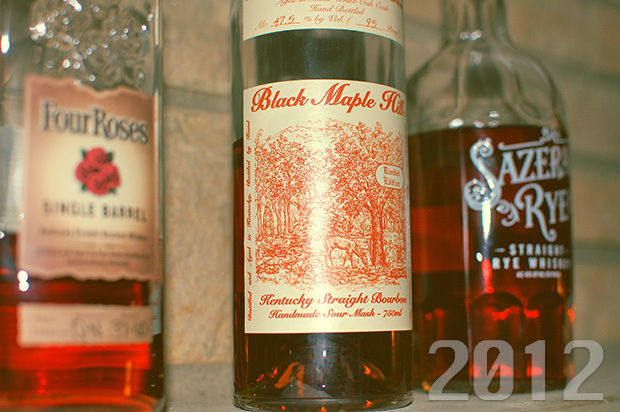 Best Whiskeys of 2012 – A Year of Trying and Buying. 2012 was a huge year for WWR and for trying and buying Whiskey, Bourbon and Scotch at every turn. Between traveling for my day job and vacation I was able to experience a lot of great (and not so great) Whiskey, Whiskey Bars and Distilleries. While I don’t have an exact figure for the amount of whiskey I sampled over the year (I stopped counting a long time ago) I did pick up roughly 50 bottles just for my personal collection. Rated extremely high and tasting even better, this single barrel is produced in Kentucky at the scenic Buffalo Trace Distillery home to other fine whiskeys including Blanton’s, Eagle Rare and Elmer T. Lee. This bottle is also a very sharp looking addition to your bar with a decanter style bottle and nice inlays for the logo and type. I think this was by far my favorite Whiskey I tried in 2012. Like a few other bottles I enjoy, this one comes from the renowned Heaven Hill Distillery in Bardstown, Kentucky and is worth picking up if you see it on the shelf. There are also higher end bottles that I hope to get my hands on very soon. Located in Columbus Ohio they have something for everyone and a great food menu (I recommend the duck flatbread). Out of the 2 locations I prefer the bar in Bexley, the staff seems a bit more friendly and knowledgeable. They also randomly had some bottles of Pappy Van Winkle available to try. I stopped in at Branch while visiting Portland and was pleasantly surprised by their selection including a bottle of my #1 find of 2012 Black Maple Hill (first time sampling it). I didn’t get any food but it looked fantastic. I am often in Southern Ohio and heard about this great Whiskey bar just over the border in Covington Kentucky. I was blown away the first time I visited as well as each time I came back. They offer an amazing selection as well as extremely friendly and knowledgeable bartenders. I follow them on Facebook and wish I could stop by their tastings and talks that they have on occasion. If you are in the area, don’t pass this place up!